presented in a beautiful range of fabulous custom made gifts. Your statement of a golden moment in history. The most ancient Coat of Arms registered to your surname. that person who has everything. Perfect for any wall, This dashing plaque, proudly displays your family Name complete with Coat of Arms, Crest and Family Motto or War Cry, colourfully detailed on a gold trophy piece, tastefully mounted on a solid walnut plaque. The Excaliber Shield measures 12" x14"
The Cavalier Shield measures 7" x 8"
Our deluxe family history! 3 items are framed together for the "must have" Surname Heritage keepsake. The Champion measures 26.5"x23.5" and includes: A full detailed history of the origins of your family surname. 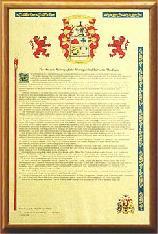 Full color reproduction of your Coat of Arms. Our Certificate of Authenticity. Highlighted in Rich Heraldic Color A glowing gold shield on Solid Walnut. With the Slash of two 32" Shining Steel Swords Each Panoply is Numbered with it's own certificate of Authenticity Offered for the first time in 20 years for a limited time, We are proud to bring you the Panoply! For something more than just a mug, try our 16 oz. Stein. 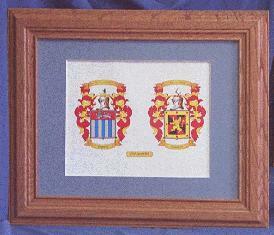 Get yours personalized with your surname and Coat of Arms in full color. Perfect for the serious coffee drinker and beer drinker alike! This mouse pad proudly displays your Family Name, and Coat of Arms. 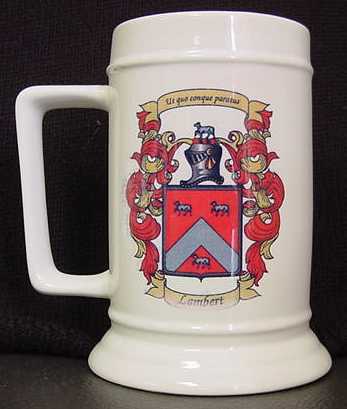 Beautifully reproduced in authentic heraldic colors with your first name, middle initial, and last name. A modest statement of dignity and distinction. Perfect for the golf course and family re-union. One of our best sellers. 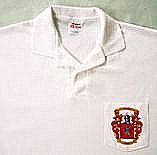 Your family Coat of Arms is reproduced in authentic heraldic colors on a white collared Golf Shirt. 50/50 blend for easy care and available in sizes S to XXL. Commemorate important and memorable dates in your life with your own commemorative bond. 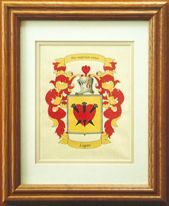 Two family Coat of Arms of your choice with your special date -- Anniversaries, Weddings, Birth announcements, partnerships. Framed in solid oak and measures 15"x 19"
An incredibly unique personal statement of your pride. 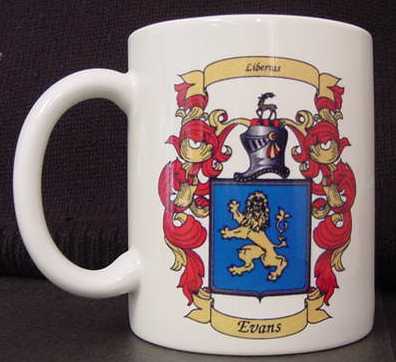 Your own 8 oz white ceramic mug emblazoned with your family Coat of Arms. Dishwasher and microwave safe and available in sets of 4. 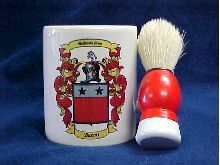 The set includes a white ceramic mug and shaving brush-- perfect for Dad. 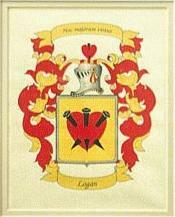 Your family surname and Coat of Arms are reproduced in full heraldic color. This 4th Item is FREE upon ordering any 3 items above!! Enter a family name and select it's origin, if you have ordered 3 items above. ©2000 Hall of Names International Inc.